Extra lightweight and versatile, the iCandy cherry is available in a choice of two chic color options - liquorice and fudge. The flexibility of forward and rearward facing seat modes has so many great benefits, giving you versatility and choice. 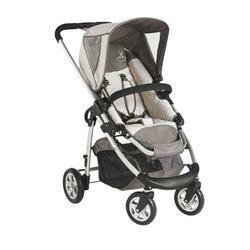 With a super lightweight chassis, easy fold mechanism and the ability to freestand when folded, the cherry is an ideal choice for parents with today's busy lifestyles. Extra lightweight and versatile, the iCandy cherry is available in a choice of two chic colour options - liquorice and fudge. An infant carrier car seat is easily attached with the use of infant carrier car seat adaptors (both sold separately). The flexibility of forward and rearward facing seat modes has so many great benefits, giving you versatility and choice. With a super lightweight chassis, easy fold mechanism and the ability to freestand when folded, the cherry is an ideal choice for parents with today's busy lifestyles. NOTE: The cherry hood no longer has viewing panels in the hood. Available in liquorice and fudge.